To tell you the truth, I don't remember the exact point in which I entered the fandom. One minute I was unaware (and maybe I little bit more innocent) and the next I was hooked. I have been reading fanfiction for a couple of years now but only just decided to become an author myself. When I submitted the first chapter of my first fic "Grounds for Inspiration" my heart was beating I like I was about to jump out of a perfectly good airplane. Seven chapters in and I'm thoroughly enjoying the entire experience and have connected with some of the best people I know because of it, even though I may not know their full name or age. I have a cat named Coco who I swear is a person trapped in an animals body. She recently developed OCD and has random bald patches from licking herself so much. I tell her constantly that she is the cleanest cat in the whole entire universe - she obviously refuses to listen. The vet tells me it's nothing to worry about. To tell you the truth, I think she caught OCD from me. Once their lives were intertwined and stuck together with superglue, but now Edward and Bella are a million years apart. 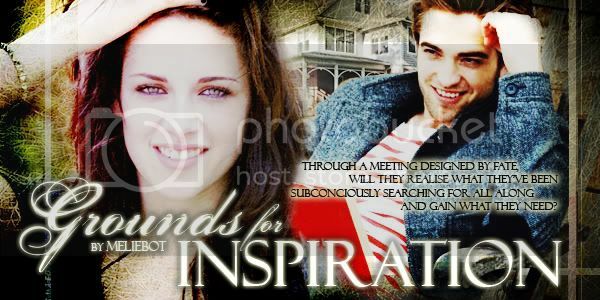 Bella, a highly successful author, lacks the inspiration to begin her second novel. Edward, a resident doctor, suffers a nervous breakdown from the stress and heartbreak his job brings. Through a strange twist of fate, they are brought together again and are given the change to gain what they have been subconsciously searching for all along and to overcome their fears... if things go according to plan.